Can we talk about why on Earth it took me this long to read this series!? Not only did it take me forever to even buy the first book (Sophomore year of college), but I’ve had the first and second books in my library for 3 years now, they even moved to South Korea with me! I decided to finally pick the book up recently because I wanted something similar to Harry Potter or The Chronicles of Nick to take my mind off the fact that my husband was at a temporary duty station for two weeks. I wanted something set in fantasy but wasn’t super involved and was light and fun to read. I am SO glad that I did! I absolutely loved it and I understand now why there is a whole huge fandom centered around the series. Percy Jackson is a 12-year-old with a history of getting kicked out of schools and is the son of the Greek God Poseidon. After getting kicked out of his most recent school, he finds himself at a summer camp for kids who all have a Greek God as one parent. Quickly after that, he is thrust on an adventure to try and stop a war amongst the gods. For a short book, I loved the amount of adventure in it. There was enough to keep me glued to the book but it wasn’t over the top. I also liked that since it’s a YA book, that the adventure isn’t gory or crazy. It’s just nice clean adventure. I was also surprised that for Percy being 12, it doesn’t read like he is. I often forgot that this is a 12-year-old boy going across the United States to save the world, he could very well have been an older teenager. I’m really excited to read the rest of the series. I looked on Amazon and there’s a box set for 25 dollars with beautiful covers. So I plan on adding that to my library soon. I can also feel this series quickly becoming an all-time favorite of mine and one of my series that I get Funko Pop Figures for haha. Overall, I loved this book and I highly recommend this series. If you like YA books with a lot of fantasy, a nice amount of action without much gore, and if you like Greek mythology then I think you would like this book. I know that the series starting out with such a young character seems off-putting for older people, but it’s not very noticeable once he leaves school. Also, if you like series such as Harry Potter then I think you would enjoy this. Book rating: 4.5 out of 5, I absolutely loved it! 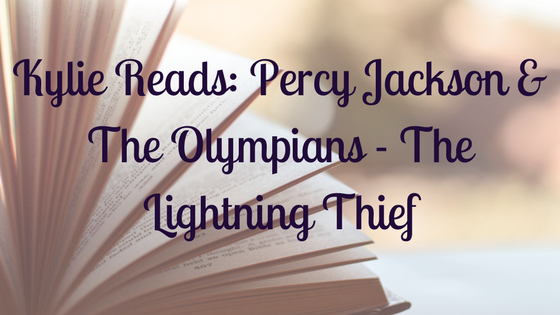 Have you read or do you plan to read the Percy Jackson series? I love Percy Jackson! I'm glad that you finally started reading them! I also forgot that I was reading about a 12 year old pretty quickly. I loved your review.